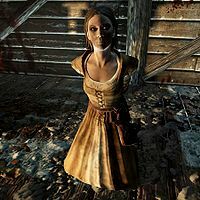 Alea Quintus, a Nord warrior, is one of the three people that may be selected from and killed to gain entry into the Dark Brotherhood during the related quest. She is the mother of six children. She does not act scared when spoken with; rather, she says that she has no time to deal with this and demands to be released. Furthermore, Alea states that she may have made enemies with the take-no-nonsense attitude she has had to adopt in order to raise her children. She wears a belted tunic and boots. She, like the other two captives, also wears an execution hood. When approached for the first time, she will order you, "I don't have time for this nonsense. I've got a home to keep and children to feed. Now let me out of here!" Otherwise she may say things like, "Cowards! Stealing a woman from her home! For shame! ", "Get these things off of me! ", "By the gods, when I get out of here you're dead! You hear me? Dead!" or "Aggghh! Re...lease me!" If you kill another captive and talk to Alea, she will say, "What's happening? Damn it, what are you doing?" "I'm kneeling here with my hands bound and a sack over my head, and you have the gall to ask me that? What do you think, genius?" "I'm, a woman living in Skyrim with six children and no husband. I don't have the time or patience to be 'nice.' Do some people look down on me? Have I made some enemies? You're damn right." "Ah, the feisty goodwife. Quite the mouth on her. Someone must have wanted her dead... right?" "Hmm. The fearless wife and mother, and the underhanded Khajiit. Had to be one of them, right? Interesting choice." "The blubbering barbarian and the tenacious mother. Must have been one of them, right?" If you kill Astrid, you can initiate conversation with Alea to free her. She will continue to boss you around, saying, "You cut these bindings this minute! You hear me? You cut these bindings right now!" After doing so, she will say, "Well it's about damn time. Capturing a woman from her home, keeping her bound like an animal. Ridiculous..." Talking to her after this will have her respond, "I don't know who you are, or what's going on here, but you ought to be ashamed of yourself." This page was last modified on 4 January 2018, at 07:16.